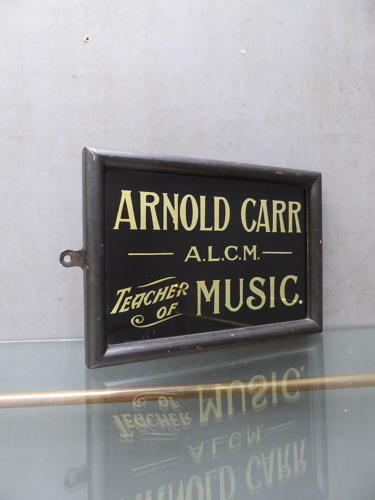 A beautiful example of a early antique glass Music Teachers sign for Arnol Carr A.L.C.M (Associate of The London College of Music). A charming gilt glass advertising sign, reverse painted in the traditional manner & set in its original ebonized wooden frame. Boasting some fantastic workmanship & a wonderful sheen to the gilt lettering (difficult to pick out on my camera! ), great subject matter with fantastic look about it! Wear commensurate with age, unrestored, great condition overall with no cracks or damage.